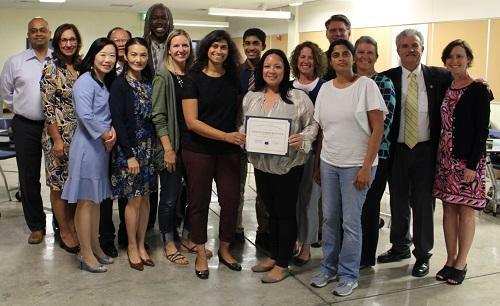 This school year, Milpitas Unified School District launched a #WEareMUSDChampions program to recognize the work that its employees are doing to keep Milpitas at the forefront as a leader in education. The campaign will recognize a certificated and classified employee each month (except for December, February, July, and August) who have served MUSD by exemplifying outstanding service through his or her work advancing a Strategic Plan Goal. 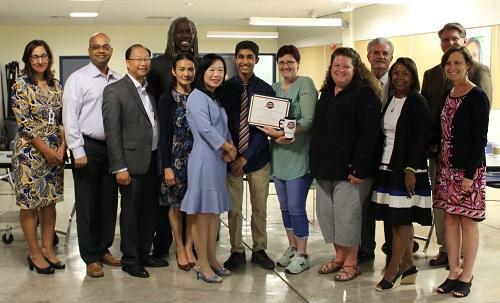 Superintendent Cheryl Jordan and Trustees honored the inaugural winners in the District's program at the September 25 Board Meeting. Sybra Dacy, a sixth-grade teacher at Rose Elementary School, was chosen for the award among certificated staff. She was nominated by kindergarten teacher Lisa Masoud for the Strategic Plan Goal, "Focus services and support systems to ensure that all students are engaged in their learning and are making social, emotional, and academic gains." Listen to more about why Masoud nominated Dacy in the video above. Carol Larin, Principal Secretary at Weller Elementary School, was chosen for the honor among classified staff. She was nominated by Tayler Titus, Weller preschool SDC teacher for the goal, "Improve communication systems for better outreach to parents, students, and staff." Watch her video above. After honoring Dacy and Larin, the videos were played for attendees at the meeting. Are you an MUSD employee who wants to nominate a colleague? Do so now online. 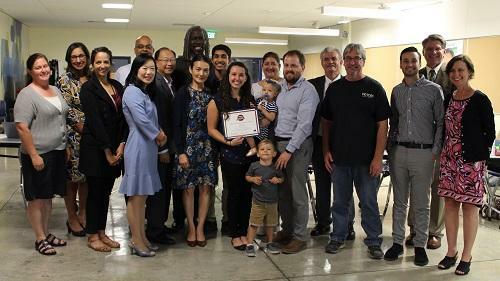 Superintendent Jordan and Trustees recognized J ohn Sinnott Elementary School's Parent Teacher Association for being one of 11 schools recognized as a 2018-20 National PTA School of Excellence. They are being honored for their incredible work as leaders in developing strong family-school partnerships and making the school environment and education experience better for every child. Each Board Meeting until all the schools are addressed, Joe Flatley, Director of Facilities Modernization, is giving a report about several sites' facilities needs and priorities, and how they would be impacted by Bond Measure AA, on the ballot in November. At the last Board Meeting, he gave a report about Randall, Rose, Spangler, and Zanker elementary schools. During the September 25 Board Meeting, Flatley discussed the Bond scope for Burnett and Pomeroy elementary schools, Rancho Milpitas Middle School, and Milpitas High School. The projects were grouped in one of four categories: safety and security, modernizations, overcrowding, and the second high school campus. A pie chart was created to show how much each category will take up in the overall budget. 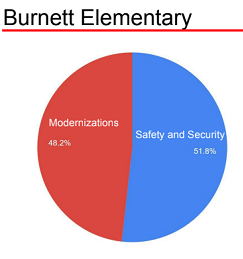 Flatley said that Burnett is pretty much equally divided in need between modernizations and safety and security at 48.2 percent and 51.8 percent, respectively. The project descriptions are the same to what is included at other elementary sites, including perimeter fencing with gates to create fewer points of entry and egress to the site, new digital fire alarm systems, accessibility, paving and concrete, exit lighting, utilities, structural upgrades, restrooms, and folding lunch tables for safety and security. Modernizations include flooring, cabinets, painting, utilities, technology, roofing, and kitchen equipment. Burnett and Pomeroy can have an immediate impact at their sites if the bond passes, as their exterior was not painted following the 2012 Measure E bond and would be included this time around. Flatley said Pomeroy has a similar scope, with 34.2 percent in modernizations and 65.8 percent in safety and security. The same types of project descriptions were listed. One of Pomeroy's most unique and biggest challenges is it needs more paving than any other school, with a lot of big cracks in the pavement. At Rancho Milpitas Middle School, modernizations are 57.6 percent while safety and security is 42.4 percent. Student nutrition services are one of the biggest needs at the site. It is hard to deliver lunch to all the students in a timely manner with one checkpoint, so Flatley said he has been working with student nutrition services and the Principal and Assistant Principal regarding where a second kiosk should go on the campus. They also discussed replacing the old lunch tables in the multipurpose room. With Milpitas High School housing so many of the District's students, it is only natural that there is a longer list of project desires and needs. Among them are a second theater and a gymnasium. Overcrowding make up a big part of the projects, coming in at 74.4 percent, while modernizations is 10.1 percent, and safety and security is 15.4 percent.